Naftalan oil is a healthy and rare treatment endowed to hopelessly ill people. It is a unique resource of the Land of Fire. As thinkers say, the Naftalan oil is the arterial blood of the Earth enriching people with vital energy. 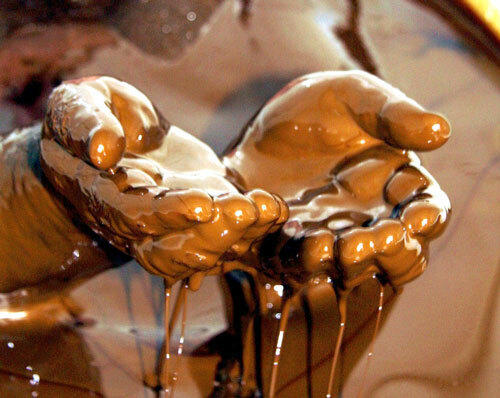 "The black gold of the Earth" is a source of healing which has no matches in the world. It is a brown-black substance with a dense texture and a specific smell. The Naftalan oil is called "the dense blood of the Earth" as well. The Naftalan city, home of the Naftalan oil, is located 320 km to the west of the Azerbaijani capital Baku and 50 km from Ganja on the south-eastern edge of the Caucasus Mountains. It is a well-known center of medical tourism in Azerbaijan which has unique natural features that are never encountered elsewhere in the world. Naftalan comes from the Azerbaijani word "neft alan", which means an oil buyer. The "Naftalan" word is explained differently in various sources. In some sources the meaning of "nafthalan" is provided as "holy washing", while Arabic sources cite it as "al-naft" or "mountain oil". According to a myth, a caravan of merchants was moving through the territory where Naftalan is currently located. There were a few lakes with dull water. In order not to injure the camels, the merchants drove out the animals from the basins. But there was a camel in the caravan who was sick and mangy. It made his owner nervous and he decided to leave his camel right there to die. Leaving the camel there, the caravan moved ahead. Upon return a few weeks later, the merchants saw a lonely but a miraculously cured healthy camel. It was surprising because everybody understood that it was that weak and ill camel that had been left there. The merchants were amazed that such a weak and ill animal got cured and followed him. And what did they see? The animal entered the dull water, bathed and then lied down under the sun. When looking at the dull water the merchants saw that there was black oily liquid and found out that it was the secret formula of the animal's recovery. They began to rub their wounds with this liquid to treat them. Thus, the people living there began to use this secret treatment and called it Naftalan. The medical significance of Naftalan was known not only among the local population but also far beyond Azerbaijan. People came for treatment from China, India, Afghanistan, Iran, Turkey and Central Asia. First information about Naftalan oil was found in Herodotus and Plutarchos' works. Outstanding Azerbaijani poet Nizami mentioned the Naftalan oil in his poetry. According to him, this oil was taken from the village of Seficurd to foreign countries by caravans. Traveller Marco Polo who visited Azerbaijan in the 13th century also refers to Naftalan oil in his writings about Great Tatarstan. Not only the local population, but also the soldiers of Alexander the Great, Rome legionaries, Vikings, Alans, Khazars and others used the Naftalan oil. It was exported to Kievan Russia, Central Asia, Afghanistan, India, and Persian Gulf countries. Marco Polo, a well-known traveler of the Middle Ages, called the Naftalan oil "a marvelous ointment treating skin disasters". In the XIX century, when Baku was experiencing an oil industry boom, European engineers, entrepreneurs and bankers came to Azerbaijan. In 1874 German engineer Yeguer was impressed by the stories of locals about the Naftalan oil and decided to export this ointment to Germany and other countries. During the Russian-Japanese war of 1904-05, cans with Naftalan oil were included in the Japanese soldiers' first aid kit and there was an inscription saying "whoever has this ointment is not afraid of wounds." Industrial exploitation and processing of the Naftalan oil began in the 19th century. During this period it gained popularity in the West. An area of 48 hectares in the Naftalan oilfield was given to eight Germans by the local governor in 1868. One of them, German chemist and engineer Yeguer, investigated the chemical properties of the oil. He was very disappointed not to discover petroleum fractions in the oil, as the oil did not burn. When he heard later about the medicinal properties of the oil, with the permission of the Russian tsarist government, Yeguer developed a small factory to produce this ointment in 1892. The Naftalan oil does not include light fractions and methane hydrocarbons and does not burn. The oil is known worldwide for its medicinal properties. It is used for baths and oiling and is applied both externally and internally. The Naftalan resort is also famous for its biological features. With all these peculiarities the Naftalan oil is used to treat over 70 illnesses, and the creation of a specialized resort brought hope to the people with severe health problems. The uniqueness and high efficiency of Naftalan are confirmed by numerous scientific studies and by more than 100 years of experience. Medicine made from Naftalan is used in various types of external and internal treatment. It is used against inflammation as an anaesthetic and disinfectant. As it penetrates the skin, Naftalan accelerates the metabolic process, boosting cell regeneration. It has a calming, cooling and antiseptic effect, relieves joint pain, cures psoriasis, calms the nerves and beautifies the skin. The type of its application depends on the specific disease and the doctor's recommendations. For diseases such as eczema and psoriasis, for instance, Naftalan-based medicine is rubbed onto the skin. The oil also helps ultrasound to penetrate more effectively, so it is rubbed onto the skin before ultrasound is applied. Patients who suffer from chronic arthritis have to go through ongoing drug treatment. Yet in Azerbaijan patients who undergo a 10-day Naftalan treatment often find that their pain is alleviated for an entire year, meaning that they don´t have to take additional medicine. There is a unique museum of crutches in Naftalan. It has hundreds of crutches of various designs and sizes. They are left there and signed by those who upon arrival at the resort could not walk without crutches. Today Naftalan is one of the ancient resorts in the world. It is part of the national wealth of Azerbaijan.